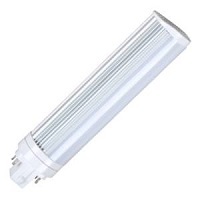 This 8w LED PL lamps ensure a long 50,000-hour lifetime, and deliver an 82 CRI with uniform consistency compared to CFLs. The lamps operate on a 120-277 volt system to easily retrofit into a variety of residential applications, including recessed cans, sconces, and ceiling fixtures. 2700K color temp. Dimensions: (inches): 6.50" x 1.38"